One of my favorite ways to spend the summer is at the ballpark. There is something magical about sitting on the bleachers and cheering on your favorite team while enjoying enticing park eats. For Christmas, I gave my boyfriend a tour of California baseball parks, as he hopes to see a game in every Major League field over time. While preparing for the trip, only a few short weeks ahead, I decided to go on a search of healthy and gourmet eats at the parks we were planning to visit. Some parks have fabulous food reviews on the web, while others were lacking. So in an attempt to fill that void, as I hit the parks to watch the game, I will also be taking you on a foodie tour of Major League ballparks. I am lucky enough to be a fan of a team whose stadium is known around the country for the foodie love. 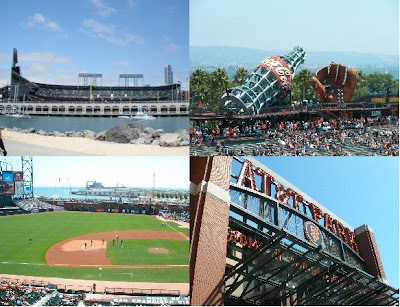 The San Francisco Giants play their home games at AT&T park, located right off the San Francisco Bay. While it has long gotten rave reviews, what people may not realize is that many of these great eats are located in limited access areas of the park. Luckily, I had an opportunity to enjoy the Independence Day game from a luxury suite (first time ever! ), so I finally got to see the full range of eats available to fans. 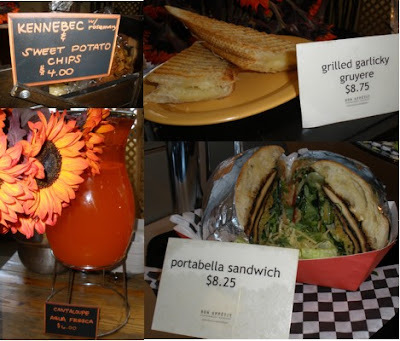 Let's start with the good eats available to the everyfoodie. While you may hear about the sushi available, know that it is pre-made grocery store variety. However if that's your bag, then you can find the sushi cart on the first level on the first baseline. But let's focus on the fresh crafted eats. My top choice (and what I picked up on my way to the suite) is the Cha Cha bowl. Orlando's BBQ was featured on the Food Network for this delight and with good reason. Just under $10, this bowl is packed with rice, beans, grilled chicken and pineapple-zucchini salsa. You get your choice of up to four different sauces that you apply yourself. The bowl is the best value for the money, filling you up with high fiber and high protein eats. Not able to get to AT&T park? You can make the Cha Cha bowl at home, thanks to the Food Network! The boyfriend got the great looking nachos at Orlando's, and while the flavors were good, the chips were either too thick or stale, making this a one time purchase. You can find Orlando's BBQ by the giant Coke bottle slide in the pavillion overlooking the bay. 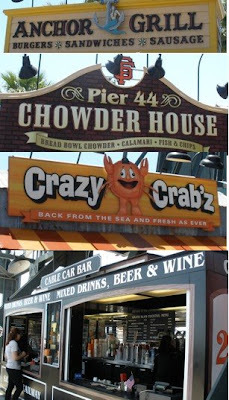 In this same area, you can also score a crab sandwich, clam chowder in a bread bowl, and some great drinks. Seated behind first base and not wanting to hike across the park still leaves you with plenty of dining options. 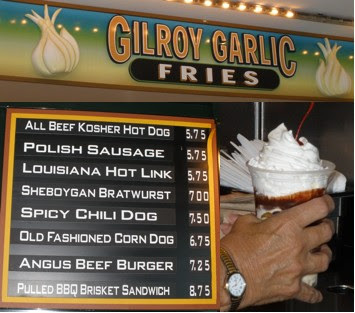 You can score some famous Gilroy garlic fries, a Ghiradelli ice cream sundae, and a variety of hot dogs and sausage sandwiches. If you aren't feeling a full meal, AT&T park offers up the traditional nuts, cotton candy and other ball park favorites. If you managed to score some Club Level or Luxuory Box seats then you are in for a treat. In addition to the great eats throughout the rest of the park, you have a plethora of gourmet eats. From the cart that sells blackberry cabernet sorbet and gruyere paninis, to the carvery serving up fresh carved sandwiches, this is an eater's dream. I wish I was camping out so I could enjoy a few more meals here! So when you come to AT&T Park, bring your appetite and your wallet. Whether you are looking for a burger and garlic fries or healthier eats, AT&T Park has a stand that will meet your needs. 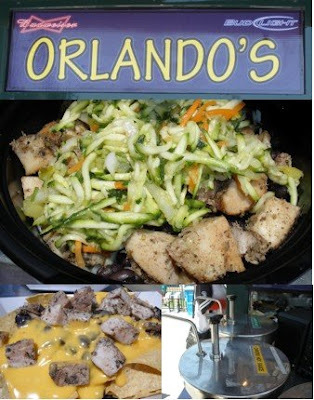 You will not want to miss out on the fabulous eats located throughout the park! Fantastic recap C.G.! Thanks for the cha cha bowl link - I need to check that out especially after reading zuchinni pineapple salsa - YUM! I think they have so much amazing food there to choose from - it takes ball park food to a whole new level! With food like that, I don't think I'd pay attention to the game at all! Hah! What a fun experience and delicious eats especially for the club seats! Love parks and the different food available there! Me and the family made it to the park several times this year. Everyone really enjoyed the festivities and the food. Can't wait to go back 2013.